You are here: Home / Ethnic Groups / The People of Sumatra / Who are the Kluet? 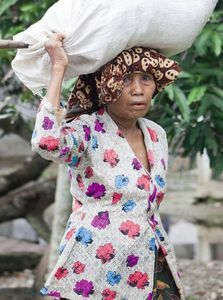 The Kluet are one of eight people groups that live in Aceh Province on the island of Sumatra. They are found in the South Aceh Regency. The area where the Kluet people live is remote, about 20 kilometers from the main road, 50 kilometers from the town of Tapak Tuan, and 500 kilometers from the provincial capital of Banda Aceh. The Kluet language has three dialects: Paya Dapur, Meunggamat, and Krueng Kluet. It appears that the language developed from a combination of the Alas, Kuo, Aceh, and Minangkabau languages. The Kluet area is very fertile, and most Kluet make their living from farming irrigated and unirrigated rice fields or growing crops such as coffee, patchouli (which produces fragrant oils), and vegetables. Other means of livelihood include raising livestock and fishing. Fish are either eaten fresh or preserved for storage, often by smoking. This type of smoked fish, called ikan saleh, is a specialty of the Kluet people. The Kluet are famous for their hunting skills since they live at the edge of the forest. During the time of Dutch colonialism they were often noted for their skill on the battlefield. It is likely that their skill as hunters is what prepared them to be such skilled warriors. They often used guerilla tactics to fight their enemies. Kluet villages are comprised of houses and a number of other buildings, including rice barns, a meeting center, women’s center, Islamic school, and mosque. The meeting center has several functions. It is used as a place to read the Qur’an, hold Islamic celebrations, and hold meetings. Young people can also sleep there if the village does not have a religious school. The women’s center is a place where women say prayers. The Kluet prefer to live in groups and only in certain areas. They have a strong sense of ethnic identity, so they live close together. They find it difficult to mix with other people groups. As a result, their culture is rather closed to outsiders. The Kluet are followers of Islam. However, traditional animistic beliefs have not totally disappeared and often have significant impact. This can be seen in their daily lives, especially in special ceremonies. Many Kluet are afraid of evil spirits. The Kluet believe that one of the graves in their area has magical powers. The Kluet say that this grave can be seen at certain times while at other times it disappears. They use magic charms so that evil spirits will not hurt them. These charms help them feel calmer and more protected.